Often regarded as the ‘most challenging 2 minutes in sports’, the SCOTT FireFit Championship is a test designed to challenge a firefighter’s physical capability, mental resilience, and oxidative capacity. To thrive as a competitor in this arena is to learn how to master the ability to control the variables at hand with precision. Firstly, if you are not familiar with the SCOTT FireFit Championships, I encourage you to watch the following video, as well as to learn more about not only the sport, but the demands physically, mentally, and emotionally at play in this incredibly short period of time. For reference, the World Record of 1 minute 12.35 seconds can be seen in the video below. Now that you have seen what it takes to compete at the highest level, physically performing it is truly an otherworldly experience. For myself, I personally felt that it was one of, if not the most, exhausting trials of my life; I came nowhere close to that time. However embarrassing my personal performance was, the key for myself is to put myself in the shoes of my athletes in one way or another. I am not a firefighter, I do not live that lifestyle, nor am I at a level to compete in FireFit. What I will do is discover for myself via analysis of my athletes and trying this personally, opportunities to help in any way that I can in my coaching efforts and program design. The purpose of this series is to discuss my philosophy of physical preparedness to optimize performance in this sport, specific to velocity-based training (VBT) efforts. Through trial and error in preparing a group of athletes for the World Championship stage in 2017, I discovered that VBT can be used in a host of ways to improve outcomes in training, auto-regulate sessions, and manage fatigue with a better lens. Lack of consistent, high quality sleep; sleep in the fire hall is a different environment than your bed at home. Shift work: one must act when called upon, and this can present itself at all times of the night. Stress of a modern lifestyle in itself, not to mention the high stress demands of a fire rescue mission physically, mentally and emotionally. As you can see, there are many variables at play that contribute to generally thriving health in the first place! Now, let’s add the layer of training year round (GPP/SPP) to compete at a World Championship level. You can expect there is a lot to manage. One issue that is prevalent within the FireFit community is burn-out. Often, athletes prepare for this competition year round at tremendous intensities and volumes, with little recovery, piled on top of consolidating with the stress of a firefighter's lifestyle. Anecdotally, I have found that many athletes have difficulty competing for more than a handful of years due to injury and a lack of recovery. In this model, it is extremely difficult to perform at your best in all facets when you only have one gear. With the stressors of the field (in brief) mentioned above, you must be smart about HOW and WHY you are training in order to be healthy, strong, explosive, and effectively manage stress in order to perform at the highest level. Health matters! Let’s get our hands dirty and discover how I personally go into combatting the consolidation of stressors at play for better performance and health. Have tremendous work capacity: simply increasing the workload in which the body can recover from. To learn more of this concept, here is a link to an excellent resource by Greg Nuckols. Produce high quality efforts with intent, consistently. Be relatively strong enough to withstand and overcome the loading demands that can be placed with the suit, hose, and dummy throughout race. Carry heavy implements for distance. Produce force with relatively longer ground contact times; although this race may seem like a sprint, the suit and boots will increase ground contact times via increased loading; therefore, an athlete must place more intent into the ground be explosive with this longer contact time in order to express specific explosive output with each step and stride. Be mentally resilient; wearing a suit and air tank requires one to control breathing frequency in a high stress environment and heating circumstance running at “full speed” through various obstacles can place high demand on your mental sharpness and focus. Simply put, if you cannot handle the heat in the “kitchen” you will run out of air in the tank faster if not careful. Have incredible aerobic capacity and lactate tolerance: This is of prime importance. In training, we want to ensure that the athlete’s conditioning program reflects an optimization (to scale) to discover opportunities to increase the speed at which one can perform under threshold of ammonia/hydrogen accumulation. (i.e., the faster that you can run this race under threshold, the better off you are as a competitor. In programming, look at maximal aerobic speed testing as a means to individualize and scale conditioning programs for your athletes. Unique to the sport and tying into aerobic demands present, athletes must be efficient in their breathing dynamics as inefficient use of air can deplete the tank at a faster rate. An athlete in this sport must be cognisant of their breathing so as not to hyperventilate on the tank. Having minimal oxygen available in the tank at the tail end of the race can certainly have its consequences. Now let us understand that I can certainly discuss all facets of the program that I implement with specifics into how I program and periodize conditioning, loaded carries, assess readiness, etc. but from a training perspective and for the scope of this discussion regarding VBT, I have experimented with a conjugate model of training for a very simple reason: to provide consistent exposure and frequency to maximal efforts (i.e., application of force via a large mass) and explosive efforts (i.e., application of force via acceleration of implements) in order to optimize performance outcomes. This model allows athletes to consistently stress themselves along the force-velocity spectrum on a weekly basis without necessarily over-stressing (if managed well and coached appropriately). Regardless of the model that you choose, the method is in the microdosing. In essence, given the lifestyle and occupational demands of first responders in conjunction with competing at a high level in FireFit, you must find the minimum effective dose necessary to incur the principles (strength qualities, training response) that you wish for your athlete to optimize. Think of your approach as ‘filling the buckets’. How can you ensure that you are tapping into each quality of performance enhancement at a specific volume and frequency so as not to over-flow said bucket? You are always monitoring specific variables and managing each in order to grasp just how far into the bucket(s) you are filling. 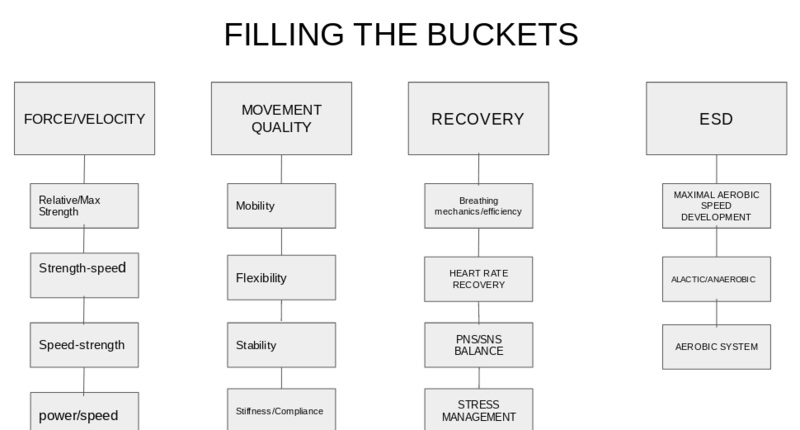 Figure 1: Example of "filling the buckets" approach to training multiple performance qualities simultaneously. What Is The Conjugate Model? In an effort to gain the best “Monday ready” ability to apply the concepts of the conjugate model, let us keep things simple. As a coach, this will require trial and error to determine a solid approach via a number of factors (training age, time, schedule conflicts, stress management, athlete needs, etc.) but the principle of the program is to alternate between “maximum effort” and “dynamic effort” sessions. We all must thank Louie Simmons of Westside Barbell in assisting in the widespread use of the conjugate model from the work of the pioneers in the field. I love to think of the conjugate model as a color wheel: I am going to allow athletes to tap into all areas of the F-V curve, shift it up and to the right, and we are going to throw, sprint, jump, lift to do so; therefore, building robust athleticism in all facets through a smart implementation of the system and microdosing volumes of each. Let’s expand on the topic of the ‘color wheel’. The conjugate model can be simply summed up into four ‘methods’ that will set the organization of your program. Max Effort Method - Lifting of a maximal load against a maximal resistance. Dynamic Effort Method - Lifting of a non-maximal load at maximal speed. Repeated Effort Method - Lifting of a sub-maximal load to fatigue. Submaximal Effort Method - Lifting of a sub-maximal load not to fatigue. Keep in mind, these descriptions are brief to explain the major differences between each, but I encourage all to look to the work of Vladimir Zatsiorsky in his book, Science and Practice of Strength Training to learn more about the methods listed above, or Louie Simmons in The Westside Barbell Book of Methods. Within the framework of this piece, I will be discussing mainly the role of max and dynamic effort methods in the conjugate model as it pertains to velocity-based training prescription, although repeated effort method can be monitored with rate and magnitude of intraset velocity drop-offs as well! Figure 2: Example of Conjugate model and where velocity-based training can be applied. Why is this model important otherwise? It helps to build buy-in and trust with your athletes. Especially in the first responder realm, many want to lift heavy often, but when you are able to tie the WHY of this system and the value that “lighter” dynamic effort days have to offer, athletes love to train in this manner because it’s fun to lift heavy AND explosive...to sprint fast and jump...to throw and condition your body. With appropriate microdosing, you are keeping athletes healthy, strong, mobile, explosive, resilient and most importantly, confident. To stress again (no pun intended), health is the priority. I have found that discovering the minimal effective dose within this model prevents the oft-experienced burnout that is experienced with athletes in this sport, as described in the section above. As a coach, when you are doing right by those whom you serve and managing what you have monitored to ensure that they are taken care of and thriving, then we have hit the nail on the head with trust. We are going to dig a bit deeper into the specifics of how I have implemented a conjugate model for FireFit athletes, with take-home velocity-based prescriptions that you may learn to apply with your populations when you’re ready. The hope is to allow these general programming guidelines to follow be a reference for you to effectively apply; remember it all depends on the context/cards that you’re dealt. It is through trial and error where you will discover how these guidelines will work best for you. Now that we have had cleared the air on the intricacies of the conjugate model and the sport of FireFit, it’s time to “get our hands dirty” if you will, regarding the basis of the system itself, equipped with velocity-based recommendations to follow so that you can begin applying at your own pace. For maximum effort sessions, my goal is to discover KPI (key performance indicator) exercises that I believe have the best ‘bang for your buck’ for a particular athlete. The greatest answer to questions regarding “what is the best bang for your buck exercise?” is, "it depends". Understand your athlete, their training age and history, determine what exercise(s) may prove to have the benefit for them to check off a lot of boxes, and go from there. What is the principle of the maximum effort method? Keeping it simple, athletes rarely, if ever, spend time in this area of the force-velocity curve. Our goal is to apply stress in the form of loading to maximally stress higher threshold motor units and critical fast-twitch fibers via the size principle. When you pair your gains, physiologically, to maximum effort work with explosive training in dynamic effort exposures on a weekly basis, you are priming yourself to be strong and use your strength in explosive efforts! Remember that we are filling buckets here to become better performers, and through intelligent programming in this model, you are killing multiple birds with one stone (mesocycle) throughout the annual process. With conjugate periodization, it is beneficial to rotate exercises 1-3 weeks at a time, so as to prevent ‘staleness’ and become exceptional in more than one way to squat, for example. Sport is unpredictable, stressors come in all shapes; prepare the body with efforts performed with a variety of exercises to continually develop in all facets and become more robust! Saying that, ‘there are a million ways to skin a cat’ may sound cliche, but it holds truth in this instance. You are constantly stressing your athlete through several variations of a given lift throughout the year, as every variation has its benefits. Split Squat - add accommodating resistance, etc. Rear Foot Elevated Split Squat - add accommodating resistance, etc. Now, this is only scratching the surface with the seemingly endless possibility of exercises to choose from, all that have their respective benefits to progress your athletes. Variety is the spice of life; express it meaningfully in your programming to prevent accommodation. Let’s put it this way, in the words of Nate Harvey, “HOW you perform your movement is far more important than WHAT movement is being performed.” Be a coach focused on the principles. Do not perform to technical breakdown, rather aim for a rate of perceived exertion (RPE) of ~9-9.5 out of 10. VBT Recommendation - ~0.19 m/s (bench press) - ~0.30 m/s (squat). You are not aiming for an all-time personal best (PB) every week; rather you are discovering the athlete’s personal best that session. VBT allows you to scale this appropriately to pair with your eye. Now, let’s not put the cart before the horse here. I am not saying that going into day 1 and performing a 1-repetition maximum is the way to go. Your goal should be to determine the training age/readiness of your athlete's and go about prescribing an intensity that will not hamper them while progressing athletes through the system in a relatively linear fashion with regard to rep ranges. Remember the principle that we are aiming to improve is force via mass/load (f=ma) in order to thereby increase the rate at which an athlete can produce force in the future. Dynamic effort days will “glue this together” to add to specific preparedness of using your strength optimally for sport performance. When our Fire Fit athletes are wearing up to 100 lbs of gear in the event, not to mention the weight of the hose stack being carried (45 lbs) as well as the water-filled hose in the 100 m task (300-500 lbs pull), maximal strength is a priority, but so is using that strength! Perform with load between 50-75% (including band tension) of 1RM of given lift. This can be performed with accommodating resistance (bands and chains) in order to optimize intent and strengthen weaker areas of the strength curve. VBT Application: 6-12 sets of 2-3 reps @ ~0.8m/s, aiming for less than 5% velocity loss, and will cut off sets @ 10% drop-off; rest periods are 45-60 seconds maximum. Why? Consistent exposure and intent across all reps and reducing decay in the strength quality that I would like to attain. This may be aggressive, but I want to build capacity to repeat and produce explosive efforts consistently over a given time period. Rest periods are purposefully short to result in theoretically building oxidative capacity of our fast-twitch fibers. The oxidative capacity and mitochondrial density of fast-twitch muscle fibers is far less than that of type 1 fibers, but why not build the relatively small reserve? The intensities, sets and reps prescribed are dependent on the phase at which the athlete is training, and the goal that you wish to achieve. The rest periods may be short, but remember that the PUSH allows for consistent speeds with velocity cut-off margins to hold the athlete accountability to. You must focus on the quality and intent of execution in the KPI lifts to be performed on the dynamic effort session. Our goal is to build strength via acceleration, and this is why I perform my lifts with accommodating resistance, bands preferably, so that athletes will have to not only learn to accelerate “through” the band tension with each repetition (thus being a form of internal feedback of intent) but also pair with the PUSH band in objectively providing feedback and intrinsic motivation to improve performances. One more factor to consider is that although acceleration is being primarily influenced in the dynamic effort method, it is not necessarily at a fast enough acceleration to be at a low load. This is why I am aiming to improve the quality of strength-speed. This is completed with a relatively high force, yet yielding considerable acceleration. When it comes to focusing on power and speed-strength, I will tap into these qualities in the context of jumps, throws, and loaded sprints of varying intensities and volumes (micro-dosed). From a 1000 ft view, we have now created an environment weekly to alter the F-V Curve. Let’s pepper in appropriate and scaled conditioning programming to boot (no pun intended) with smart, thoughtful execution = a recipe for potential success. Let us be cognizant of the emphasis that your prescription depends upon the athlete that you are coaching and how they have responded to their training. These recommendations are by no means a ‘be-all end-all’ but rather a reference for you to effectively understand what you should be looking for, and how to manage performance to optimize quality of training in the response that you are looking for. From here the focus will be placed on strategies to prescribe jumps, plyometrics (yes, they are different! ), throws, and accessories for the FireFit athlete and how you can place in the training process as a means of attacking weakness and microdosing appropriately to take care of the health of your athletes. Now that we have tackled the ‘big rocks’ on the sport of FireFit and the conjugate model in detail specific to velocity-based training means, the goal for this next piece is to discuss the implementation of jumps, throws and plyometric activities into the training process. An extensive to intensive progression of jumps, plyometrics and throws, all with a relatively longer ground contact time. 3-5 sets of 3-6 contacts. I generally incorporate Adam Feit's plyometric progression resource. Progressive increase from 18-30 contacts/session. E.g. 3x6, 4x6, 5x6 with each week (18, 24, 30 exposures, respectively). Re-test to assess, and progress exercise slightly (unloaded vs. loaded box jump @ same height). On this note, the reason for more repetitions (reasonably) is to first build a semblance of capacity within each set in order to ‘grease the groove’, progressing to less exposures (6x3 for example) when intent, quality and consistency are established. VBT Application: > 1.3-1.8 m/s (mean velocity target). Typically with ballistic exercises in this realm, we will aim to the higher end of this range. In regard to sprinting, this is a far more complex discussion to have in better detail, but generally I will prescribe loaded sprints (~50% BW) @ a minimum effective dose (to be determined by the coach) in addition to unloaded as a means of potentiation as well as increase force applications at slightly longer ground contact times. As you will typically see in a contrast method, this expresses similar sentiment. VBT Application 1: ‘Repeated effort’ method in which you will discover submaximal loading and perform at typically a higher rep range in order to induce ammonia accretion (the “pump”) to promote skill retention (greasing the groove), awareness, and perfusion. If you are going to use your PUSH band, aim for velocity drop-offs of > 40% to elicit greater ammonia production, as Dan Baker has suggested here. VBT Application 2: Dependent on the goal of the phase, you may want to stay away from inducing delayed onset muscle soreness (DOMS), therefore keeping exercise intensities in a typical manner of velocity drop-offs < 20% between repetitions per set. I have anecdotally used this in the past with success. This section of the workout is also a tremendous opportunity to include carries and sled work (i.e., timed, heavy, etc.) at different volumes and intensities for a more specific response as the off-season progresses or simply as a tool to build trunk stability and centration. Another option is to implement shorter duration conditioning programs (I have recently based mine on maximal aerobic speed numbers) to allocate a short period of time to individualize conditioning and hit required distance markers in a relatively fatigued state; this is the essence of this sport, and to be honest, all sports. Focus on not only how you start, but how you finish. 7th task - victim rescue - 185 lbs simulated rescue dummy - pick up and drag back 100 feet to finish. Reflect on those final two tasks and understand that the best in the world get through the entire course in under 90 seconds. This does not pertain to VBT, but you must condition yourself and use your strength in fatigued states to be able to withstand the demands of the sport! To conclude, understand that there are many ways to use the conjugate model as a means of eliciting high performance outcomes, but more importantly, understanding the principles of the system is what makes the difference. Through the use of velocity based training, you can further optimize and complement the system with the results of your athletes effort, with respect to intent with each session via objective feedback. On another important note, consider that you should not simply run your athletes through this model. Unless you really have a grasp of your athletes from all facets and are monitoring effectively, and assessing the volumes at which you train each quality, you can work into this program. One must understand the intricacies of tampering with volumes in this model to best suit the individual athlete within the model. It is by no means a one-size-fits-all system, rather a framework based on principles to work from. Specifically for FireFit, this model helps to adhere to the color wheel of performance qualities (F-V Curve), as this sport has demands across the spectrum to say the least. The conjugate model is not simply a powerlifting program, if that at all. It is based on mastering the principles at hand in athletic performance. To fill the buckets of strength, power, speed, and conditioning each week, so long as the athlete is ready. Keep in mind, you cannot manage what you do not monitor, so manage different indices of performance relevant to each bucket throughout the preparation process so that you may discover best practices to how you adjust the volumes of each in order to thrive! Try this system, become more integrated with the details of it, and read more about how the conjugate method will work for yourself and your athletes. I personally recommend the work of Nate Harvey in his new ‘ConjugateU’ book to further delve deeper into this model. This discussion has been specifically tailored to the influence of velocity based training, but understand that the beauty is in the balance. Above all else when it comes to thriving in the sport and performing with high quality in an explosive manner, optimize health first!